I made this in collaboration with my friend Johan from Moedern Kitchen, and this content is cross-posted there. This is not my first foray into the world of cocktail-inspired ice creams. My first was not up to snuff, and never made it to the web. My second was Mai Tai Soft Serve, which you may remember. Today, I am proud to share an ice cream Sundae inspired by one of my favorite classic cocktails, the Last Word. This drink is famous among cocktail enthusiasts, and as a Seattlite, it has a special place in my heart, since it was re-popularized in the modern cocktail renaissance by our very own Murray Stenson. To make this ice cream sundae, we wanted to do something ambitious. It’s easy to get carried away when dealing with modernist techniques, and I think you will find that we did not exercise any restraint at all. The green Chartreuse is really the key to this drink, as it is the source of its unique flavor. Even so, the combination and the balance are such that every element is a first class citizen. We went through several iterations before we settled upon this arrangement. What is the right way to marry an ingredient to a preparation? I confess I do not have any formal method for making these decisions. The base of an ice cream sundae is the ice cream, and for that reason, it seemed fitting to use the base spirit of the drink, which in this case is London dry gin. As I have noted before, actual spirits do not come through strongly when added to an ice cream base. We can achieve much more flavorful results by using the root flavors of the spirit, rather than the spirit itself. To make a London dry gin ice cream, we used a hint of gin, but we steeped coriander, orange peel, and juniper berries into the cream. I don’t have the exact ratio, but this will get you pretty close. Note that we use the same base recipe as in Johan’s licorice ice cream. Before combining the ingredients to make the ice cream, infuse the milk with gin botanicals. In a pan, toast up 2 tbsp of coriander seeds and 2 tbsp of juniper berries, until the oil starts to bloom on the juniper. When the berries are shiny, drop all of the spices into the milk, and gently heat on a stovetop for fifteen minutes along with one fat orange peel, trimmed of pith, then strain. A good ice cream sundae should contain many layers and textures. Moreover, the last word, although quite spiritous, is a citrus-driven drink. It needs to the acidity and the punch of fresh sour lime juice. To achieve this end, we made a lime juice curd using this lemon curd recipe from chefsteps, subbing lemon for lime, and omitting the gelatin. I cannot stress this last point enough. In our first attempt, we used the optional gelatin suggested in the recipe, and wound up with a disgusting congealed mass. For the maraschino, we made a zabaione, which Johan called by some incomprehensible Norwegian name (eggedosis) that he will probably edit in here. Integrate using a mixer (or a whisk, if you want to work on those arms), and load into an iSi whipping cannister. Charge it up and shake it. For the green chartreuse, we made a fluid gel. Modernist techniques often feel like solutions in search of a problem, but in this case, a chartreuse gel was exactly the thing. We adapted this recipe from chefsteps as well, substituting fresh orange juice with green chartreuse, and omitting the citric acid. The texture and mouthfeel was unusual, but it felt very at home in a sundae, filling in the same space where one might otherwise find chocolate fudge sauce. At this point, we had all of the elements, and a variety of soft viscosities, but a sundae also needs crunch, contrast, and texture. To this end, we repeated some of the flavors, and expanded on others. Ice cream wants some kind of cookie or crumble, and we opted to use two. The first was a cinnamon shortbread, which we crumbled up and used as the bottom layer. I used this recipe from Serious Eats. A healthy outpouring of ground cinnamon. Don’t overmix the cinnamon in the shortbread, in order to create a marbled effect. I don’t know how much I used, but you’ll know it’s right when you see it. Cinnamon may seem like an odd addition to the dessert, but it complements and expands on the cinnamon flavor that is present in green chartreuse. It does not repeat perfectly, but it does rhyme. The second cookie was a tuile, which also came from Serious Eats. We integrated this, allowed it to cool, then spread it into a thin layer on a silpat using an offset spatula, and baked it at 176 C until it was just brown all over, about 12 minutes. For the final plating, we just shattered it into pieces. In addition to cookie textures, we added a couple of soft and chewy elements. The first was dried sweetened pineapple, compressed with a citrusy new age gin called Uncle Val’s Botanical. To make this, we bought dried sweetened pineapple chunks in bulk from a supermarket, and compressed them in a chamber vac with a shot of gin. The longer you leave them sealed in the bag, the softer they get. We let ours sit for about two hours before draining them. They kept in a jar for quite a while afterwards, and had the texture of soft gummy candy. We chose pineapple because it pairs wonderfully with lime, maraschino, and green chartreuse, but in truth, the pineapple was mostly covered by the gin. Finally, we topped it with falooda seeds soaked in a mixture of London dry gin and water. These are popular in some asian and Indian desserts, and they have the amazing property that they will soak up any liquid in which they rest. They are sometimes colloquially called frogs eggs, but they have a similar texture to modernist caviar made with sodium alginate. Since they soaked up a little gin, they were the perfect vehicle to give a tiny boozy kick to the dessert, which was otherwise lacking. This was a lot of work, but the result was something truly special. Categories: classics, original creations, spirituality | Tags: booze, chartreuse, cinnamon, cocktail, cocktails, craft cocktails, drinking, drinks, gin, last word, lime, liqueur, maraschino, mixed drinks, mixology, molecular mixology, spirits | Permalink. This is just a bit of housekeeping, because when I do a series of posts with a common theme, I like to have a single landing page for them. Herein, I will sum up my collaboration with Johan at Moedernkitchen on a four course Easter dinner with cocktail pairings. An amuse-bouche of shiso sorbet, paired with a fizzy aperitif of shochu, ginger, daikon, and horseradish. Lamb “katsu”, smashed peas, rowanberry jam, paired with a drink of gin, sugarsnap peapods, green tea, and mint. Easter Bunny and Do You Even Carrot All? Rabbit leg confit, parsnip puree, caramelized shallots, “melted” carrot, paired with a drink of light rum, mango, carrot, and habanero. Cherry blossom opera cake, cherry blossom tofu mousse, and cotton candy, paired with a drink of white tea, junmai daiginjo sake, and preserved cherry blossom. If it was not immediately obvious, our goal for each course was to appear in a different color commonly associated with the easter season. If our pastels were a little too vibrant, well, who really wants to eat pastel-colored food? Gross. Most people don’t want to drink four cocktails in a row, even if they are paired with food, so I kept the alcohol content a little lower than average, (~1 oz per drink) and my strategy was to use abrasive agents such as ginger, horseradish, mint, habanero, and tannins from tea in order to offset the rich food. Mixed drinks often deal in strong flavors, and it is easy to overpower a food accompaniment. For the best degustation, keep your drinks light and your food bold. Categories: modern drinks, original creations, spirituality, Uncategorized | Tags: alcohol, bartending, booze, cocktail, cocktails, craft cocktails, dinner, drinking, drinks, easter, gin, liquor, mixed drinks, mixology, molecular mixology, rum, sake, sakura, shochu, spirits, tea | Permalink. As the Spring Quartet progressed, the harmony of our naming scheme might have come apart. Johan at MOEdern Kitchen opted to call his dish “The Slaughter”, but I thought that was too light-hearted, and I went with the more serious “Easy Peasy Matcha Crusta”. Sugar snap peapods are both green and in season, so they were a perfect fit, thematically. I love their earthy bitterness. In order to bring out their best flavor, we cooked some of them sous vide at 85C for 15 minutes, and combined their juice with that of raw peapods. The raw ones have more green plant complexity, while the cooked ones trade some bitterness for sweetness. To the peapod juice, I added fresh mint juice, sugar, and tartaric acid. The exact seasoning of your juices is a matter of taste. I cannot tell you a precise recipe because your crop of peapods will be different from mine. Trust your own good judgement, and try to find a balance of sweet, sour, and bitter. Add a pinch of salt, and the juice of fresh mint until it finishes with a bit of cooling menthol. Regarding the choice of acid, how is one to choose? I wanted acidity, not flavor, because the drink is complex on its own, but I also needed to cut the sweetness. All sweet and no sour is like a life with all pleasure and no pain. It spoils children and cocktails alike, and lacks dimension. I opted to use tartaric acid for this drink, in order to preserve the purity of the flavor, rather than accidentally invoke the juiciness of malic acid or the lemony quality of citric acid. It’s a curious thing that these acids, without affecting flavor, are still evocative of their common carriers. A crust of green tea around the rim of the glass made an elegant garnish, and its flavor complemented the other green elements of the drink. Greens of most varieties pair well together, and the grassiness of matcha is no exception. In the same vein, gin, made from green botanicals, likes other greens. Shake, double strain, and pour into a glass rimmed with green tea. Combine white sugar and matcha powder, then coat the rim of a glass with juice from a wedge of lime, and then apply it to the matcha mixture. It matched the meal, of course, which consisted of a high tech lamb nugget, deep fried in panko and parsley, on a bed of green pea mash, topped with rowanberry jam. Mint and gin complement lamb, peas match with peapods. It’s not rocket science, but it would have been if we served it with arugula. Categories: modern drinks, original creations | Tags: alcohol, cocktail, cocktails, drinking, drinks, gin, lamb, liquor, Mint, peapods, peas, rowanberry, sugar snap peas, tartaric acid | Permalink. I don’t have a lot to say about this one. I was leafing through The Flavor Bible and my eye landed on on this combination: “Dill, Yoghurt, Cucumber”. And of course those things go together. Who here hasn’t enjoyed tzatziki sauce on a gyro, or a bit of cucumber raita alongside their vindaloo? Shake over ice and double-strain into a coupe. Garnish with a sprig of dill. Absent garlic and other savory elements, this did, in fact, taste like a tzatziki sauce. It was good, especially paired with seafood, which we were eating at the time. The herbal notes in the gin are a natural fit for cucumber and dill. It’s so obvious it’s almost academic. I found it to be light and refreshing; the yoghurt was not too heavy on a summer night. The name “Rai Tai” is a play on the name “Mai Tai”, but of course, this is a far cry from a Mai Tai, or even a tiki drink. Even so, I’m sticking with it. 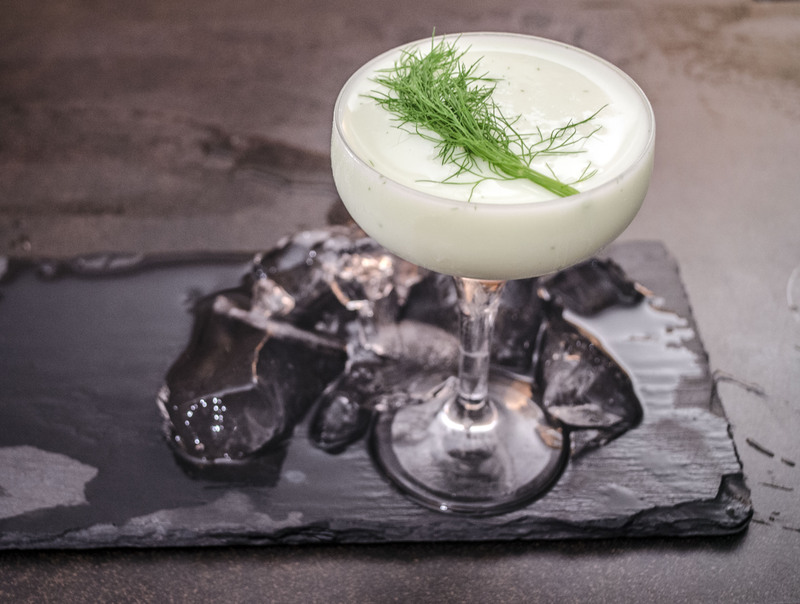 Categories: modern drinks, original creations | Tags: alcohol, bartending, booze, cocktail, cocktails, craft cocktails, cucumber, dill, drinking, drinks, gin, lime, mixed drinks, mixology, Raita, Raitai, Tzatziki, yoghurt | Permalink. Since I’m officially doing the whole blog thing again, I am participating in Mixology Monday, hosted this month by Muse of Doom at Feu de Vie. The theme this month is “Fire”, so I decided to do a video post. I haven’t done one of these before, and to be honest, I’m a little self-conscious. Hopefully it’s cool. Light a teaspoon of lavender on fire and then place a large glass over the smoldering flowers, so that it fills with smoke. Stir the drink and then strain it into the smoke-filled glass. Big thanks to Muse of Doom for this hosting MxMo with this exciting theme. Categories: modern drinks, original creations | Tags: alcohol, bartending, booze, cocktail, cocktails, craft cocktails, drinking, drinks, fire, gin, lavender, lemon, liquor, martini, mixology, molecular, molecular gastronomy, molecular mixology, simple syrup, smoke, spirits | Permalink.